I for one, was looking forward to finally getting on this *classic* hike. Sure its right next to the city, sure there can be plenty of people on it, but its a classic nonetheless and to be experienced at least once, right? Two days prior we car-camped at Stewart Creek to hike San Luis. Although that went well we weren't all that interested in car-camping again. For this one we slept at our condo in Frisco till about 2am and then hit the road for Manitou Springs. As we reached the Barr Trail parking lot around 4:30am there were a few cars there, but nobody around. As we made our way up the trail about 10 mins in we finally heard the sounds of another car pulling up. This would be a beautiful hike for us. Conditions were just great and the views were fantastic as we saw the Springs lit up by sunrise and the morning lights coming over the trees and nearby ridges. We had made it to Barr Camp feeling great and stopped inside to chat for a few mins and grab reinforcements. We expected the second half of the hike to be difficult but now that we were really warmed up and into the hike we made quick work of the last 4000 feet to the summit. We spent a good deal of time on the summit as we were waiting this day for my wife and 2 boys to meet us on the top for some fun. As many other hikers have reported, it was within a minute that I hit a 5 minutes of fame celebrity status. Had several tourists ask with wonder about the trial of actually getting up Pikes by your own two feet (and for free I might add!). Couldn't ask for much better weather. No rain or even any threats of it. Clouds were rolling by us all morning but nothing that looked at all dangerous. After we summited clouds started rolling up the eastern slopes of Pikes from below us and even engulfed the summit from time to time. We were likely early enough on our approach that we got ahead of the larger numbers of hikers on Barr Trail. We only ran into 4 other hikers on the way up to Barr Camp. Ran into another 3 or 4 groups that had left Barr Camp on our way up to 12000. After 12000 it got more crowded as there were quite a number of runners who seemed to be going up and down the last 2000 in training for the Pikes Marathon. Wow do these guys (and gals) make me feel like a couch potato. I was in the best shape of my life this summer and they were just flying up and down this high altitude trail. Congrats to you guys! For me, this was one of the quickest paces I've maintained on any hike. It helped being in great shape this year from training. In fact I felt so good I pushed it at a speed walk from around 12700 to the summit. I was seeing just how hard I could push and it felt great. (Still wish we'd made the hike down now). Here is my KML track from the hike. This was taken on my Nokia N800 tablet using the Maemo Mapper app. Fantastic piece of software! I hope anyone can find this useful. While one hardly needs a GPS to navigate the Barr Trail I found it useful to be able to scout the route ahead of time on Google Earth (entertaining too!). 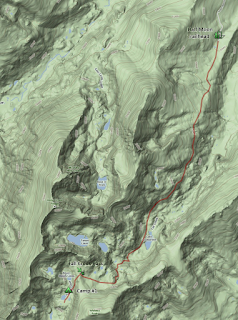 Its also notable that the 14ers.com site currently does not have this route with any information. Embedded below is the slideshow from Picasa of the photos I took on this hike. The photos are all geo-tagged so you can also look at the photo map on Picasa to get an idea of where each photo was taken. 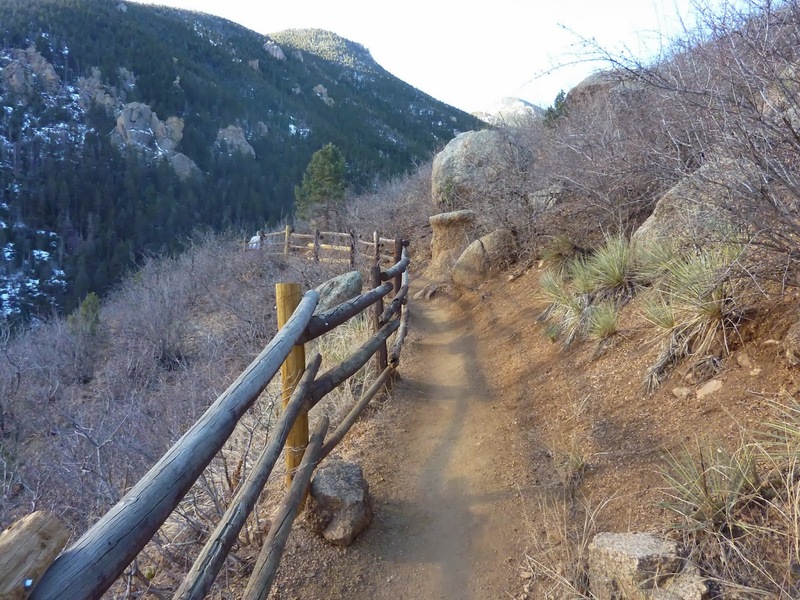 The descriptions with each photo will help in getting an idea of what the trail looks like.